You can visit McDonald's on Clement Attlee Way, about a 1.92 mile drive north from the centre of Portsmouth, in Port Solent (alongside Junction 12 (Portsbridge) of M27). The restaurant is a convenient addition to the districts of Tipner, Port Solent, Paulsgrove, Fort Widley Married Quarters, Hilsea, Cosham, Ports Down and Horsea Island. For your convenience, its hours of business today (Monday) extend for 24 hours. Working hours, location info or direct telephone for McDonald's Port Solent, Portsmouth can be found on this page. 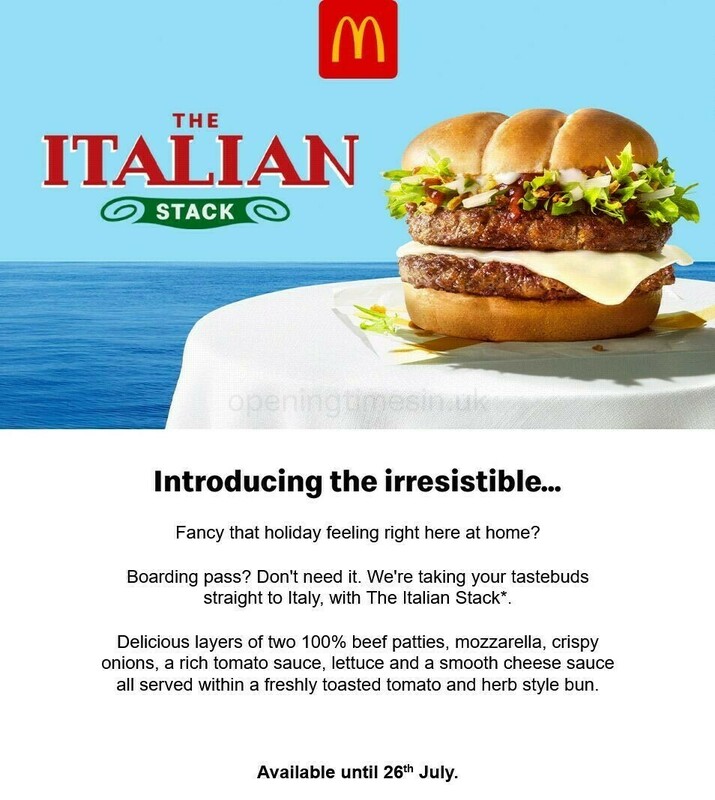 You'll find McDonald's conveniently located in the vicinity of the crossroads of Southampton Road and Clement Attlee Way, in Port Solent, Portsmouth. Merely a 1 minute trip from Port Way, Newlyn Way, Carbis Close and Lock View; a 4 minute drive from A27 / Southampton Road, A3 / Southampton Road and Western Road; and a 10 minute drive time from London Road and Northern Road. Please enter the following postcode when using Satellite Navigation systems to find this location: PO6 4SR. If you prefer to travel by bus, alight at Newlyn Way Roundabout, Woofferton Road, Paulsgrove Tesco or Racecourse Lane. Regular train services run to and from Portchester Station (1.20 mi), Cosham Station (1.50 mi) and Hilsea Station (2.45 mi away). The South West Trains line stops a short distance away. Nearby you can visit St Paul's Catholic Primary School, The Boardwalk Shopping Centre, Catholic Church, Beacon View Primary Academy, Tesco Delivery Yard and Victory Primary School. There is presently a total number of 5 McDonald's locations open in Portsmouth. For an entire listing of McDonald's restaurants near Portsmouth, refer here. Please note: national holidays may prompt exceptions to the daily opening times for McDonald's in Port Solent, Portsmouth. In 2019 these changes consist of Christmas Day, New Year's, Easter or Bank Holidays. It's suggested that you visit the official website or call the customer information line at 370 524 4622 to get specific info about McDonald's Port Solent, Portsmouth holiday operating hours. Help us keep the information as current as possible. If you find errors in the address or restaurant hours for McDonald's in Port Solent, Portsmouth, please inform us by using the report a problem form. Your comments on McDonald's are welcome. Please use the form below, as well as the star ranking scale to rate this restaurant.